The Make Your Own Havaianas event. I Made my Own Havaianas! 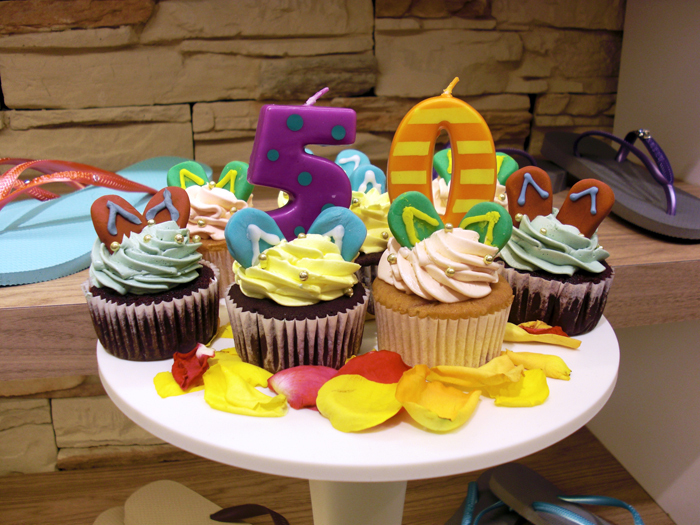 Recently, Havaianas celebrated their 50th anniversary. The h Store in Takashimaya Singapore held a special Make Your Own Havaianas event, where guests could customise their very own pairs of Havaianas. I was invited to the VIP event, which was one day before it was opened to the public. Here’s what went down! I tried a yummy red velvet cupcake. The Havaianas Slim for ladies. A range of colours to pick from. Even the straps came in several shades. I picked Sand Grey. Each of us got to pick any two pins we liked to be added to our straps! Additional ones cost S$1.50 each. Once we decided which sole, strap and pins we wanted, we headed to the main counter where our Havaianas were put together right on the spot! My Havaianas in the making. I picked the cyan-coloured soles! Very beachy, and I love the bright colour! My assembler fitting my pins onto the straps. A nice light pink Swarovski! How pretty! And a cute, sparkly turtle! My finished pair of Havaianas Slim! Totally customised and one-in-the-world! I had a fun time and I really, really, really love my new pair of Havaianas Slim! I already own a pair in dark brown but that one’s getting old and worn out. I’m so glad I managed to find a colour combination that I love – it’s so tropical and happy! It’s going to be perfect for the beach weekend getaway that the boyfriend and I are planning for. Can’t wait to wear this out! Some berries ice cream with soy milk via Phaz-ing. I Made my Own Havaianas! was last modified: July 18th, 2012 by Roxanne C.